Among the acknowledged benefits of a rapid, regular metro-style rail service is the economic agglomeration effect generated around station sites, and this combined with a similar impact on housing density and increasingly house prices is a powerful set of benefits. 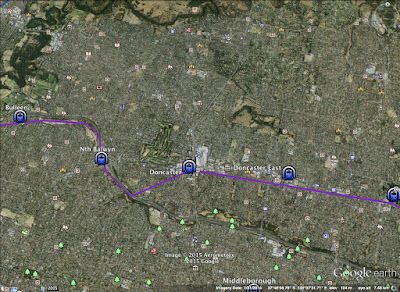 Let's have a look at London and Melbourne, viewed from an almost identical vantage. 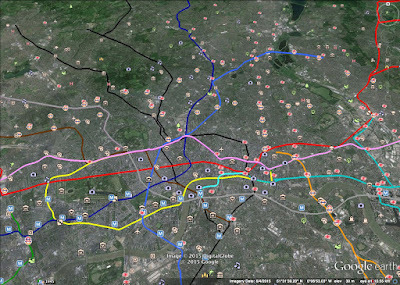 London is overlaid with its tube map as well as underground and overground rail stations, Melbourne with its current railway network and stations. A few obvious conclusions are that the London network is more extensive (remember, overground lines aren't shown, only stations). 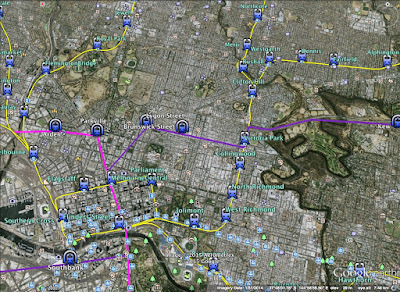 The London network also services significantly more stations than the Melbourne network within any given area, including central/downtown/CBD. Any fool ought to be able to look at these two maps and indicate which is the significantly denser city. The other obvious contrast is the predominantly radial nature of the Melbourne network against London's more distributed model. A more even dispersal of stations, particularly across inner urban areas. Metro-style rail can therefore seemingly be used, if London is any guide, to enhance the economic agglomeration effects within suburbs and to plan for increased density. 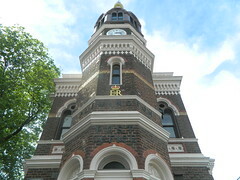 There is however urgent the need might seem, scant evidence that policy in Melbourne is currently being used at all effectively towards that end. The history of planning for Melbourne's suburban CADs is one of a tremendous idea being launched and re-launched about five distinct and separate times. None of them involving any kind of substantive policy or follow-up whatsoever. Furthermore, as Alan Davies has pointed out, there appears to have been little detailed work done in the nomination and selection of the six designated centres. "It seems the Government simply picked six centres under the existing Transit Cities Program and designated them as CADs." 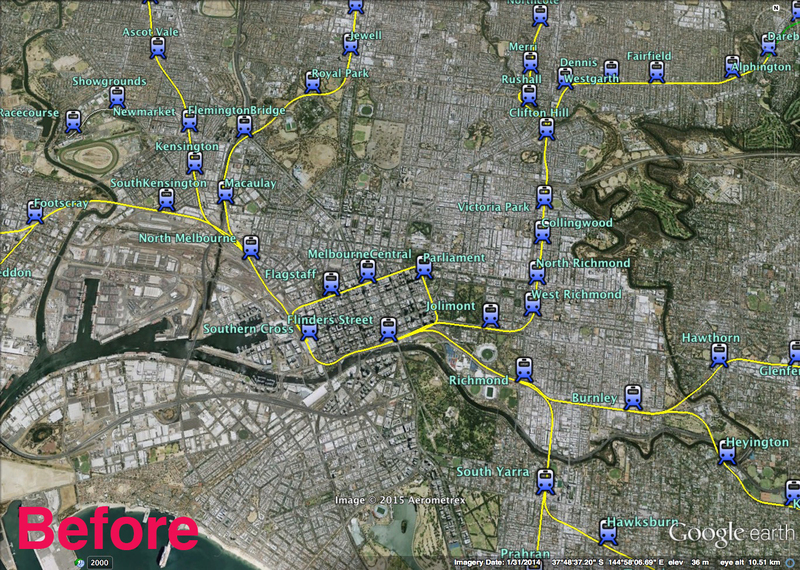 These are Broadmeadows, Box Hill, Dandenong, Footscray, Frankston and Ringwood. I strongly believe the focus on a mere six or so suburban CADs is woefully inadequate to drive the revolutionary changes I outlined in part one. If you want to talk about "five minute cities" (and I really don't, given that's all so much conceptual hot air), then from a purely geographic perspective alone, you're going to need a lot more than six CADs to make this a possible time saving or mode shift incentive for enough people to make a significant impact. My plan is based on the theory that institutions have a realistically finite geographic 'catchment' of shoppers, attendees, whatevers. 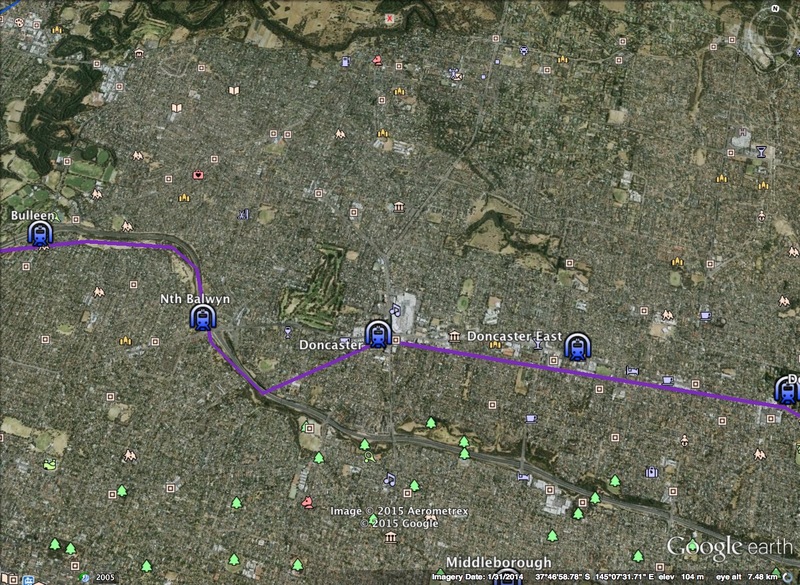 And that catchment's size and shape will be determined by their transport options to the venue in question. It is based on the theory that the RADIAL TO THE CBD nature of our rail network is therefore working largely against the development of CADs, which in theory have their own potential radial catchment that is only partially catered for by the current rail network, which in a lot of cases purely bisects the CAD's catchment like two opposite spokes on a wheel. 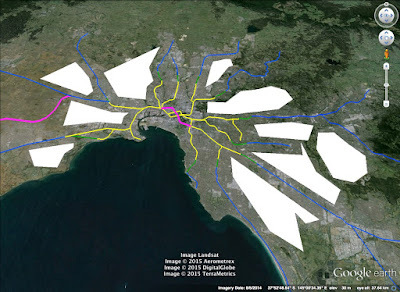 My plan creates a series of twenty three suburban CADs, and a network development plan that services all of them radially via three or four railway "spokes". My plan would support these changes with new planning zones around CAD stations to allow and mandate higher density and mixed use. Councils would be actively discouraged from approving sizeable non-residental developments outside of these zones, and the State Government would develop incentives for businesses to relocate or establish there. A key goal here is rationalising the number of routine daily destination points for Melburnians, and thereby enabling the ease with which the fixed transport network can service them. Another objective I am simultaneously trying to meet is delivering a system which acts more as an integrated web of stations, between which one can travel ultimately web-like in any number of directions without the need to travel in to a central point first, and a web which networks to all the major regular destinations - shopping and employment centres. This is envisaged as applying to the bus network too. This invites arterial analogies, where the bus network is the fine capillaries that carries the oxygen that final few yards "home" and to either to the arterial rail system or a specific organ/CAD. So EVERY suburban bus that networks with the train system knows which train it connects with and it has no journey start time until it's loaded all the passengers from that train. I see much smaller, cab-style buses taking smaller loads on numerous new radial routes to and from railway stations, but I'll discuss the other necessary enabling aspects of the network in part three. Again using catchments theory, it's not difficult to identify where the key rail "dead spots" are in Melbourne. 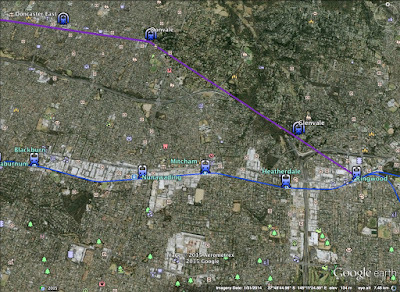 The following image uses Google Earth to highlight them in white, according to both existing and predicted future urban growth boundaries. That is to say, I've allowed for geographic growth in the west, but used existing residential areas in the east. Presently committed network extensions are shown in pink. The obvious takeaway here is that the biggest gaps are at the suburban fringes sitting in islands between the existing lines. 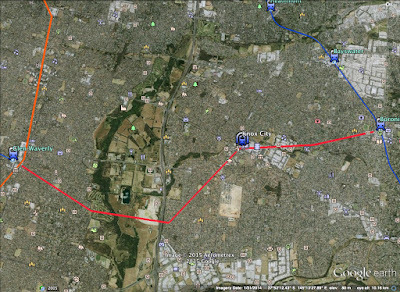 As the lines extend further from the CBD, the greater these distances become. The two furthermost right-hand zones give you an estimate of exactly how many Melburnians were sold out by the decision to terminate the Glen Waverley train line there. There are currently three Melbourne train lines which terminate in the suburbs - Alamein, Glen Waverley and Upfield. When it comes to consider network extensions, these are the obvious places to start. This whole idea being enabled by the transformative elements of the Hunt vision, these extensions are predicated on a willingness to consider the cost of tunnel-based extensions to the network, thereby allowing complete flexibility in route selection. In reality, these extensions could equally be enabled my a mixture of modes. I very strongly believe that there would be little resistance to for instance double-decking major suburban arterial roads like Springvale Rd with a train line, so possibilities exist for a number of these extensions to be performed through mixed tunnel and elevated carriageway. Cases could also be made for doing these extensions via light rather than heavy rail. What I don't want this exercise to get bogged down in is route selection minutiae. Have a look at the feasibility study for airport rail if you want to get a sense of what a rabbit hole that sort of approach is, the entire discipline is beset with engineering complexities I'm in no way equipped to address. I'm headline policy, someone else would be implementation. 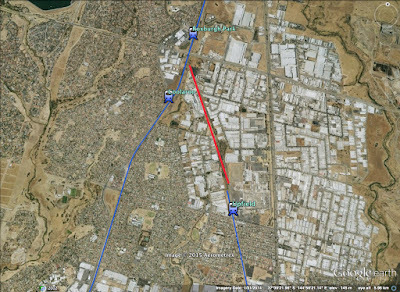 The exception to the above is the Upfield line, where freight lines already exist to re-connect with Craigieburn just before Roxburgh Park Station. This extension is shown in red below. Existing lines are blue. It would be difficult to make a case for any new stations on such a short section of track through a heavy industrial area. Public transport into industrial zones is notoriously difficult because of the widely distributed proliferation of possible destinations. These areas don't have "CAD" areas where a station might otherwise logically go. 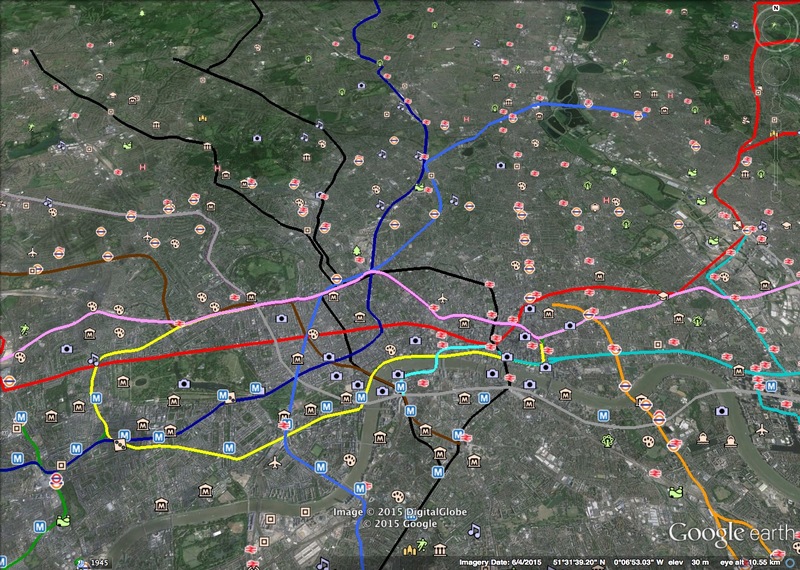 This would be the cheapest of all the mooted extensions given it's just an electrification of existing track. This extension does already exist within PTV's long-run network development plan. But we'll look at costings in further detail in part three shortly. Most likely this would be the second-least costly of the proposed extensions. 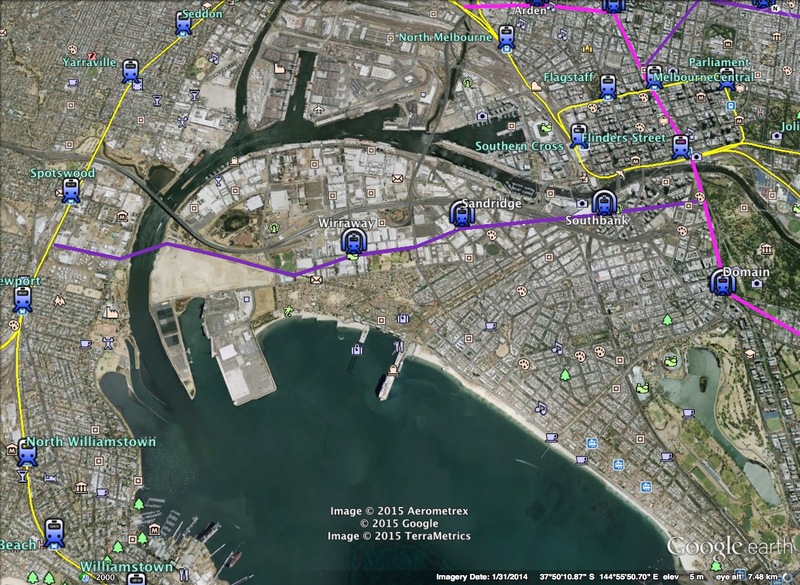 A wide bike path and reserve presently runs from the end of the Alamein line down to the river. 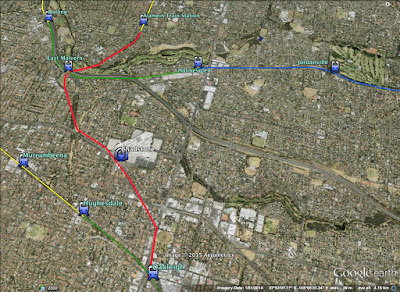 This section could therefore be delivered overground, but the line would certainly need to pass beneath the river and Monash Freeway. The main purpose of this extension is providing a heavy rail solution to Chadstone Shopping Center. This access could be provided cheaper again via some double-decking of the Princess Highway and Warragul Road to Oaklegh. This extension would provide interchange points at East Malvern for the Glen Waverley line, and Oakleigh on the Dandenong line. Now, things start getting really fun. As we saw above, the decision to terminate the line at Glen Waverley was arguably the worst planning decision in Melbourne's entire civic history. We now have a chance to envisage the network had this mistake never been made. 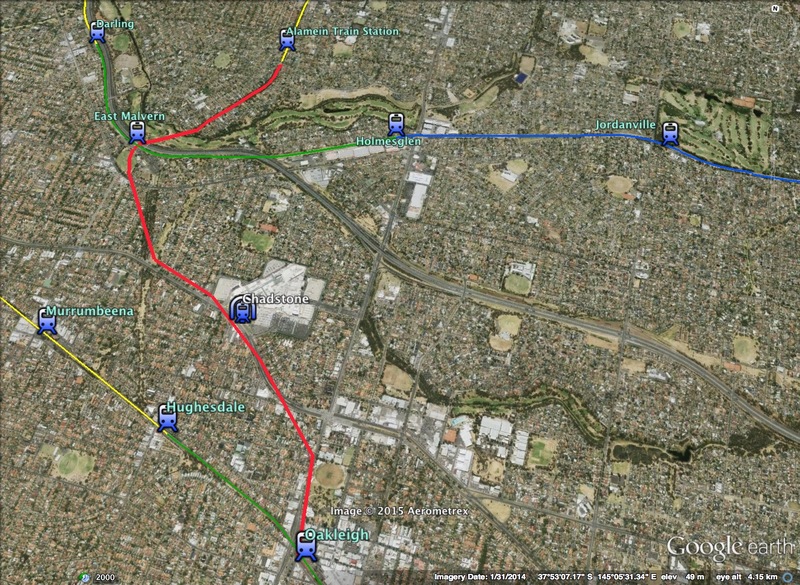 This extension runs from Glen Waverley to Boronia station on the Belgrave line. It includes a new station at Knox City. You'll note I've been pretty conservative with new stations on the extensions. I've largely used the criteria that new stations should only be created to a) allow rail access to a major, previously unserviced destination or b) allow rail access to a sizeable residential catchment not presently serviced by rail. You could certainly make a case for another one or two stations along an extensions this length, but the large "green reservation" alongside Eastlink means there's actually a huge residential vacuum that obviously doesn't need to be catered for running right through the middle of the extension area, which obviously would complicate the siting of stations. 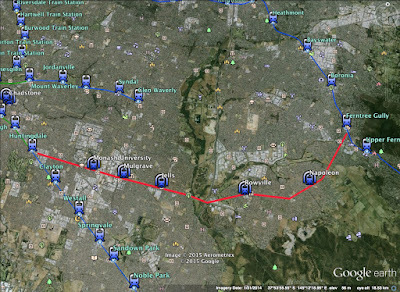 I also propose the creation of a new branch line to run from Huntingdale Station via Monash University through Rowville to also reconnect with the Belgrave line at Ferntree Gully. 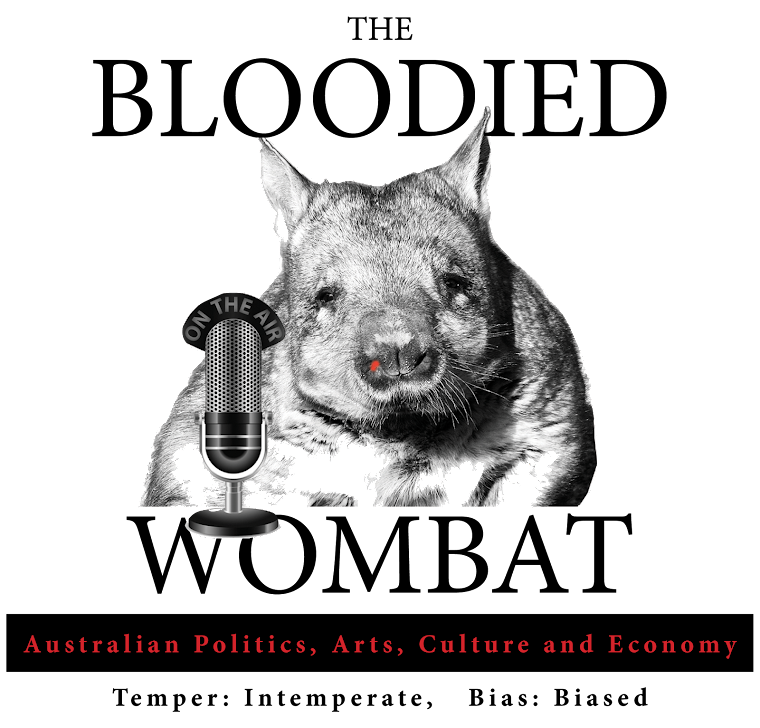 This has been selected on the basis that Monash University probably sits somewhere near the top of the network's highest demand, presently-unserviced destinations, and as we've seen, this would traverse one of the network's largest overall 'blackspots'. It's important to state here that the terminal stations with these last two extensions have been selected with a view to the terminal stations becoming newly designated CADs. 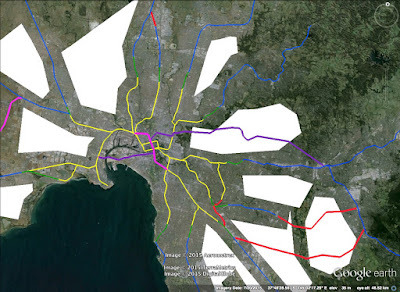 The effect of these extensions is to add a third "spoke" to the station's effective catchment area, as previously stated with the purpose of allowing more radial travel to the CAD from within its catchment, such as would be impossible under the current "radial from the CBD model. I propose the creation of five new stations along this new branch line, so effectively there would now be fifteen, rather than ten railway stations within a five station radius of Ferntree Gully. It's also important to state that one of the few areas we've had success in creating urban agglomeration of employment in particular around CAD-type centers have been the research and health precincts around Melbourne and Monash Universities. This chart, courtesy of Alan Davies tells the story more eloquently than I could. 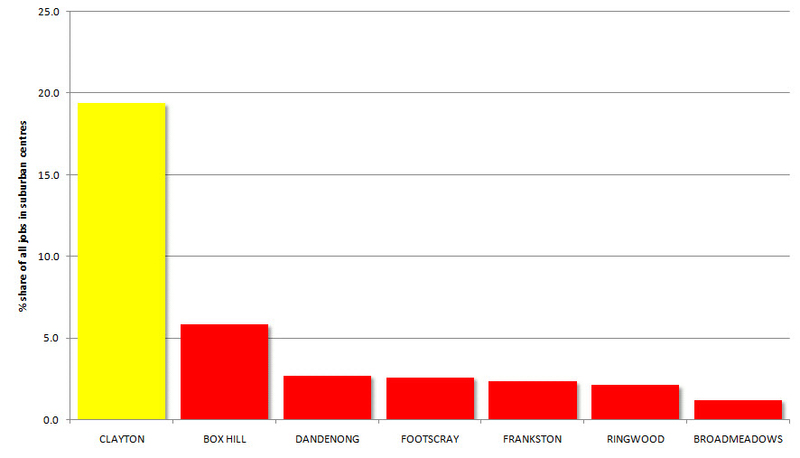 It shows what percentage of suburban jobs are in the existing six designated activity centres, relative to the non-designated Monash/Clayton. This tells you EXACTLY how much planning and foresight has gone into initiatives around CADs to date. 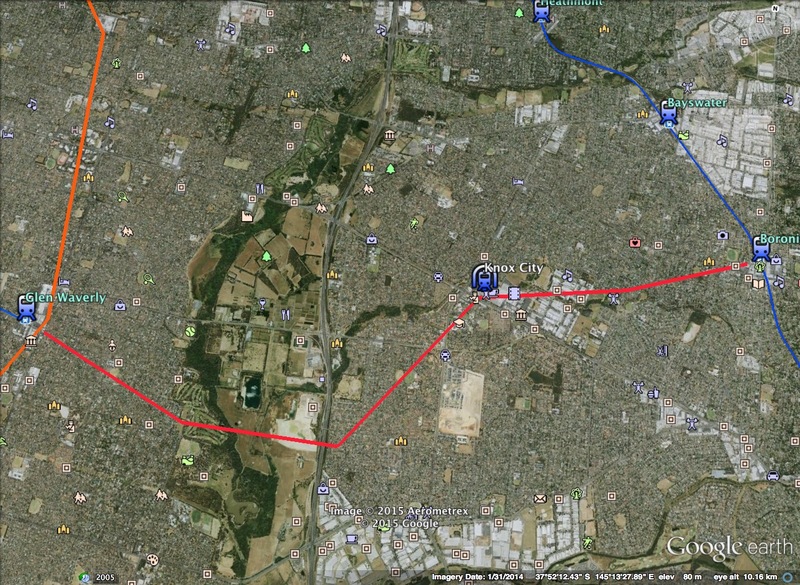 While the new extension only creates two "spokes" leading to Monash, this would also be expected to be developed under my plan, as a formally designated CAD. The significantly larger catchment to the area enabled by this extension is crucial to that. Moving back to the network's center, the other medium-run identified network need in terms of currently-unserviced destinations is the new Fisherman's Bend urban renewal zone. I am not the first person to propose doing this, but I believe I am the first to map any proposed extension back to long-run network needs. Under my proposal, Werribee line trains would be removed from the City Loop, running instead via Newport station, over the Yarra mouth via a new bridge. As we later see when we look at road network extensions, this would actually serve both road and rail, providing the much-needed second river crossing, and freeing up capacity on the West Gate. The new route would travel above ground via Webb Dock - it's important here to state that if any case is made for retaining any dock functions in the central city, that those activities should be concentrated at Webb Dock, and per part one of my proposal, and the remainder of the dock land be rezoned for medium density infill housing. This based on the idea that we have failed dismally to get more freight out of the ports via rail. This can only be remedied by the re-imaging of the entire dock rail infrastructure, such as the effectively greenfields site at Webb Dock would allow. 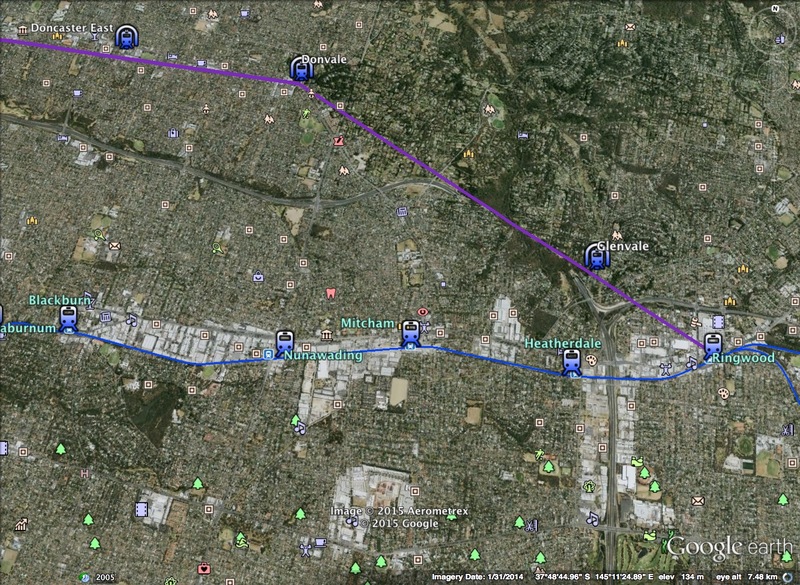 The route could then be cut and covered through the urban renewal zone, dipping into a new bored tunnel at Southbank to meet the Melbourne Metro tunnel somewhere south of the Yarra. 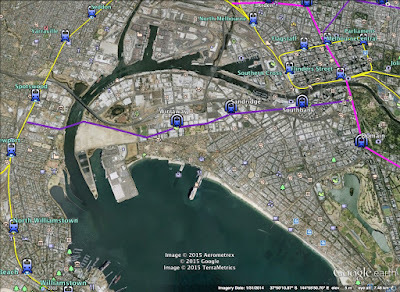 This route proposes two new stations in the urban renewal zone - Wirraway and Sandridge, and an underground station at Clarendon Street/Southbank, servicing the western end of the casino and the Convention Centre. There may well be issues with placing a tunnel in the Coode Island silt here. It's possible a Southbank station would need to be located further from the river, in which case you'd probably look more at something closer to South Wharf. Again, I don't want to get bogged down in too much of this sort of detail. Most effective Metro style networks operate "cross-city" routes. 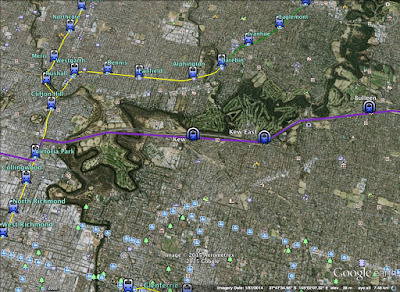 Putting Werribee line trains in the Metro tunnel is not a solution in itself, as they'd then be forced to run on some weird loop back to one of the northwest group lines. This would not be catering to any identified major travel need. When we look at airport rail in the next part, one other option here would be to run a Werribee-Airport route, if we decided Doncaster rail was not a priority at this time. 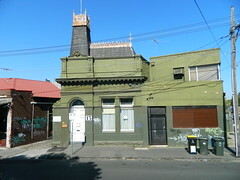 I propose the creation of two new stations at Lygon and Brunswick Streets in a new underground tunnel which connects Melbourne Metro to the Clifton Hill group lines just south of Victoria Park station. This element of the proposal is CRUCIAL to the objective of creating an inner-city metro-style network such as London possesses whereby travel is dispersed across a wide range of inner city stations, and with that having been essential to London's significantly less CBD-oriented network. The effect of London's network has been to promote high-medium density development across a highly-dispersed set of inner city stations, most of which serve multiple lines. I then propose to run a line along the Eastern Freeway reservation. A lot of work would need to be done on the new "freeway stations". Alan Davies has suggested the existence of significant open space reservations around the freeways will ensure the catchments for these stations are complicated. If you drew a radius around each of these stations, the area covered would include large unpopulated sections. 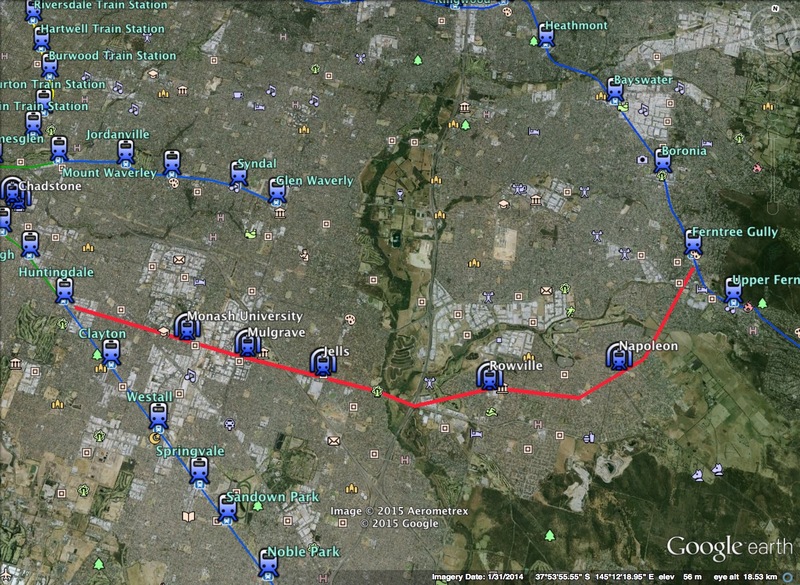 These stations would not be integrated with other than the existing rail (or in fact freeway also) network. They would almost certainly function primarily as park and ride destinations, although significant thought should be given to integrated changes on the suburban bus network to create more effective public transport catchments for these new stations. The stations would be significant undertakings, requiring extensive car parking and bus interchange points factored into the design. 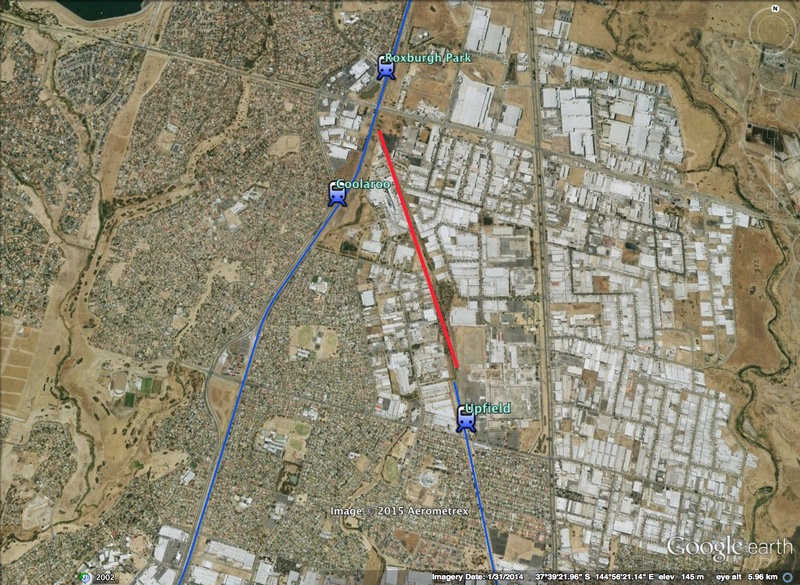 I propose to have this line leave the freeway via tunnel to Doncaster, and again possibly through a mixed mode of undergrounding and double decking to join the Ringwood group of lines directly AT Ringwood station (Eastlands). Ringwood would be another rare example of a designated CAD where some initial agglomeration does already appear to be occurring, and per previous examples, my plan provides a third spoke to increase the station's "five stops" catchment to fifteen rather than ten stations. So. We've come a very long way in the last thousand words or so. We've plugged a lot of those major blackspots out east, but there are still enormous network needs in the north and west. Arguably the boldest part of my plan moves to plug those in a way that will really highlight the transformative, revolutionary potential for urban development that getting the heavy rail network fully optimised and fully integrated will deliver. I'll be back in a few days time to take the wraps off part three, whence the magic will truly have its genesis.